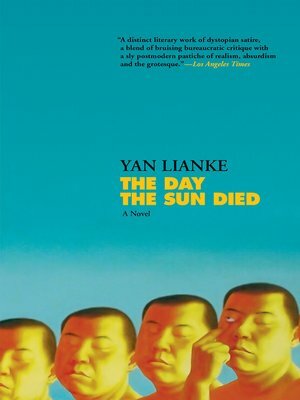 Yan Lianke has secured his place as contemporary China's most essential and daring novelist, "with his superlative gifts for storytelling and penetrating eye for truth" (New York Times Book Review). His newest novel, The Day the Sun Died—winner of the Dream of the Red Chamber Award, one of the most prestigious honors for Chinese-language novels—is a haunting story of a town caught in a waking nightmare. In a little village nestled in the Balou mountains, fourteen-year-old Li Niannian and his parents run a funeral parlor. One evening, he notices a strange occurrence. Instead of preparing for bed, more and more neighbors appear in the streets and fields, carrying on with their daily business as if the sun hadn't already set. Li Niannian watches, mystified. As hundreds of residents are found dreamwalking, they act out the desires they've suppressed during waking hours. Before long, the community devolves into chaos, and it's up to Li Niannian and his parents to save the town before sunrise. Set over the course of one increasingly bizarre night, The Day the Sun Died is a propulsive, darkly sinister tale from a world-class writer.